The Welcome Wizard helps you to get oriented in Netsparker Enterprise, stepping through how to add and scan your first website. Default options are selected, to help you proceed quickly through the demonstration. 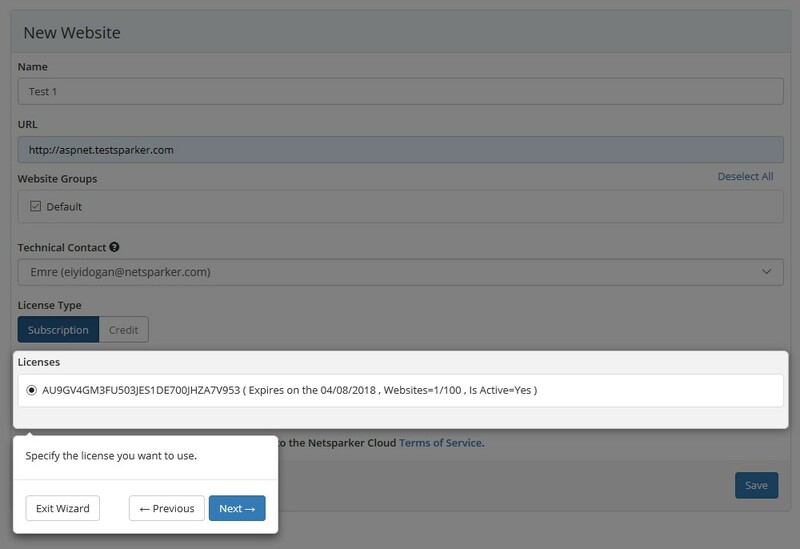 For further information on how to create a new scan in Netsparker Enterprise or Standard, with more customised options, see Creating a New Scan. When you set up your account with Netsparker Enterprise and log in for the first time, you will see the Welcome Wizard. Click Next. The Websites menu opens at the New Website submenu. Click New Website. The New Website step is displayed. In the Name field, enter the website name and click Next. The URL field is highlighted. In the URL field, enter the website URL and click Next. The Website Groups field is highlighted. The Website Groups checkbox is enabled by default. Click Next. The Technical Contact field is highlighted. In the Technical Contact field, enter an email address, and click Next. The License Type field is highlighted. In the License Type field, select your license type and click Next. The Licenses field is highlighted (in the Netsparker Enterprise On-Premises edition only). In the Licenses field, your license is already added. Click Next. The Save button is highlighted (in the Netsparker Enterprise On-Premises edition only). Click Save. The Scans menu opens at the New Scan submenu. In the New Scan window, click Next. The Target URL field is highlighted. In the Target URL field, enter the URL of the website you want to scan and click Next. The Scan Options dialog is displayed. In the Scan Scope pane, take a look to orient yourself, and click Next. A Notifications popup is displayed. Click Next. The Launch popup is displayed. In the Launch dialog, click Launch.